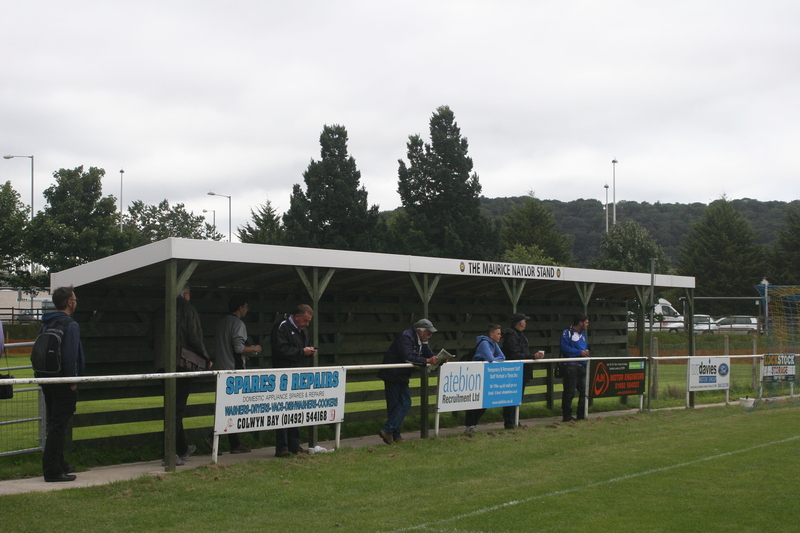 I joined the Welsh Alliance hop one game late after an unexpected Friday night visit to Cefn Druids. 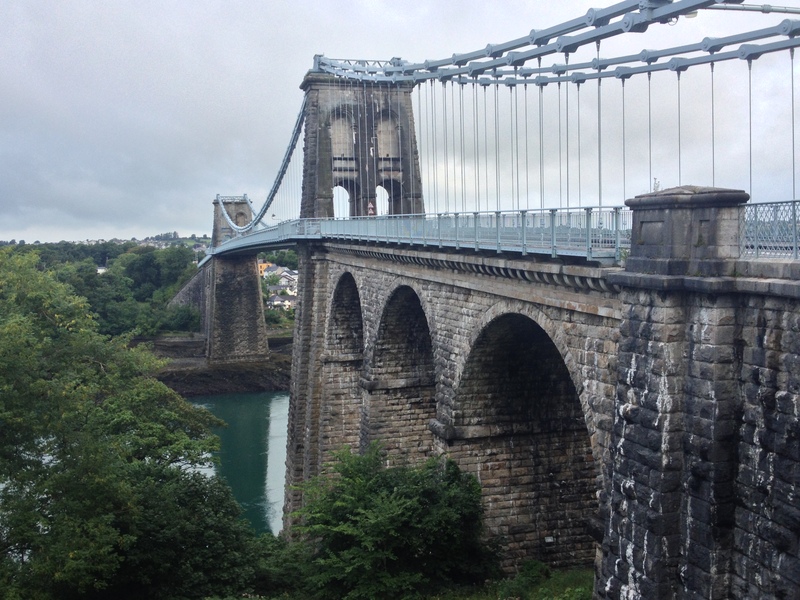 So Saturday morning began with a trip over the Menai Straits using the historic old Thomas Telford iron bridge. First port of call was to Llanfairpwllgwyngyllgogerychwyrndrobwllllanty-siliogogogoch and this involved the obligatory photo of the railway station with the longest name in the world. 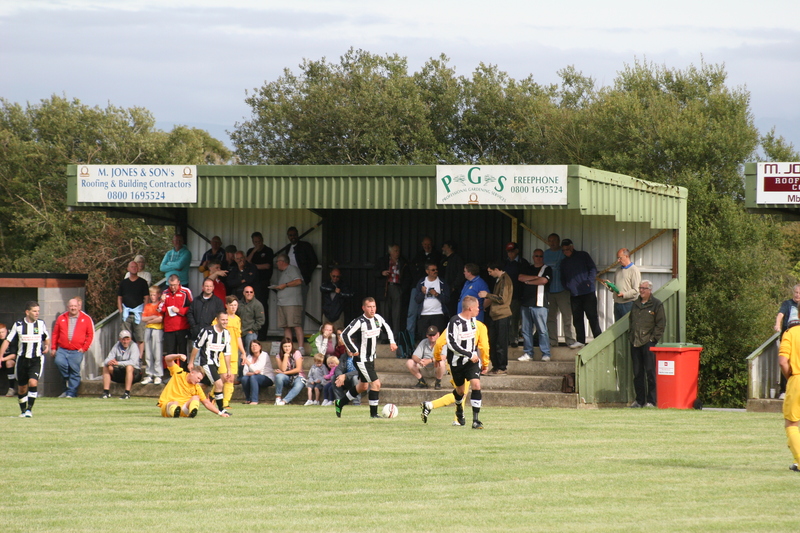 The local football side moved to their current ground of Maes Eilian in 2008, their Gor’s Field home still in use for the club’s reserve team. 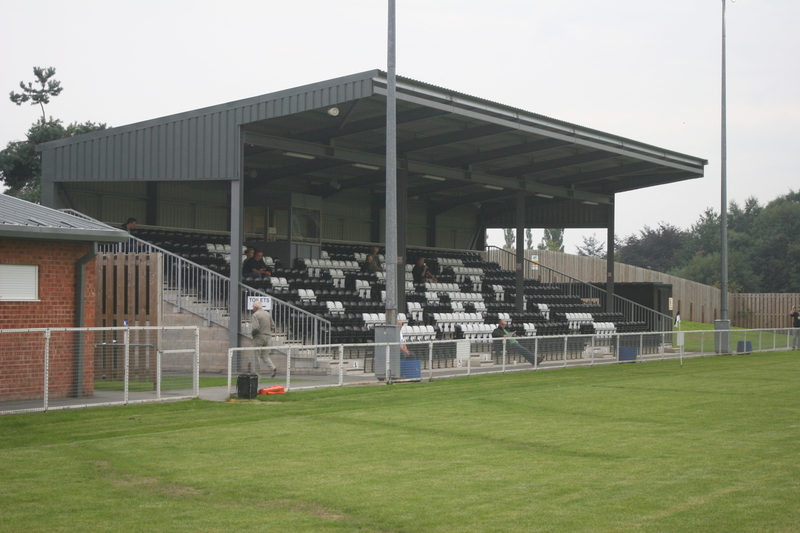 The current ground is decent with a seated stand and a covered terrace. More importantly the welcome is cordial and accommodating. The home side prove far too good for their troubled visitors Pwllheli. 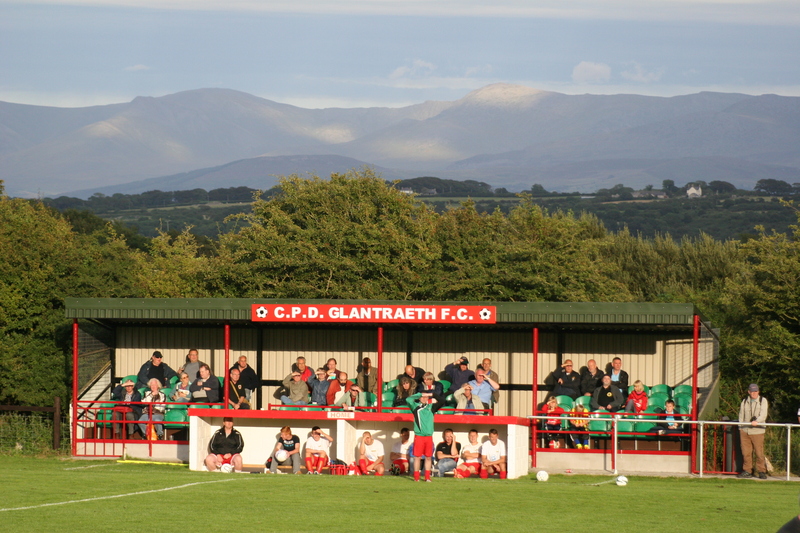 Despite a penalty saved by Kevin Davies, the visiting keeper, Llanfairpwll rattle in four quality goals without reply. 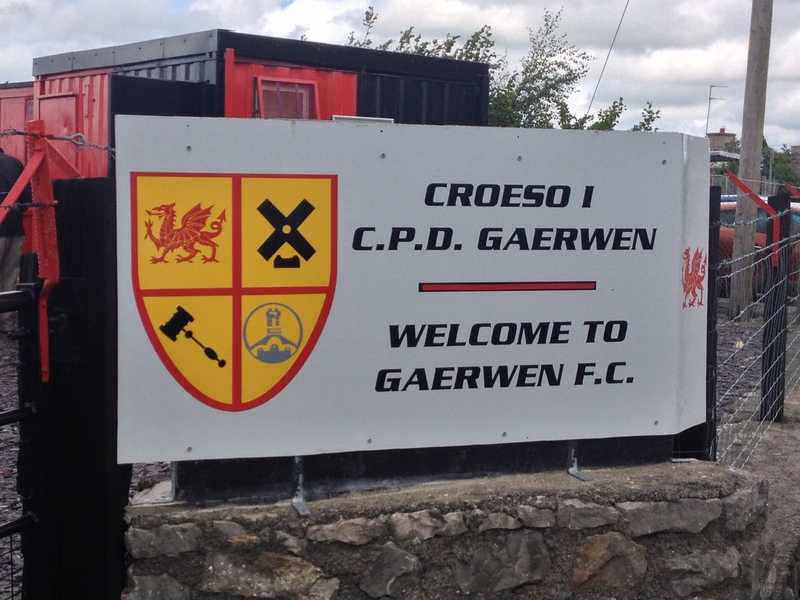 A quick drive to nearby Gaerwen for some Second Division action between the local side and Penrhyndeudraeth. 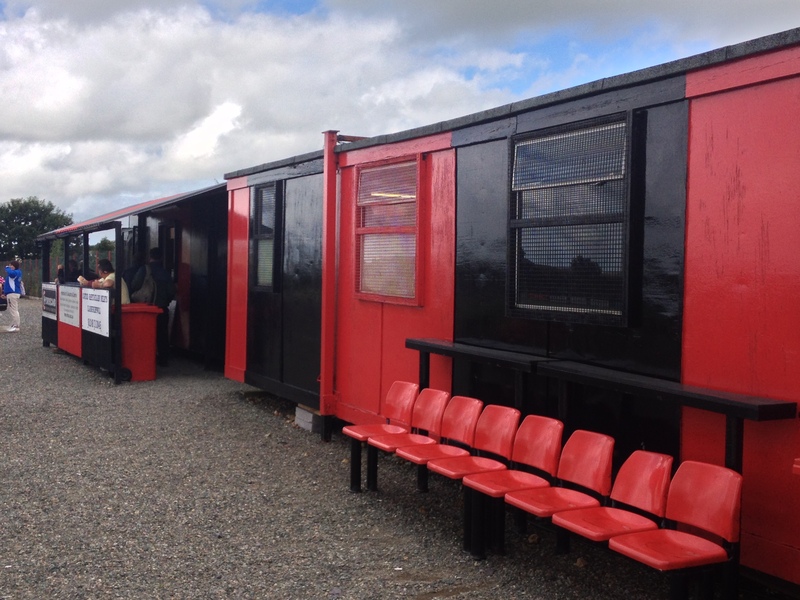 Lon Groes is an immaculately kept ground liberally splashed with Gaerwen’s red and black colours. 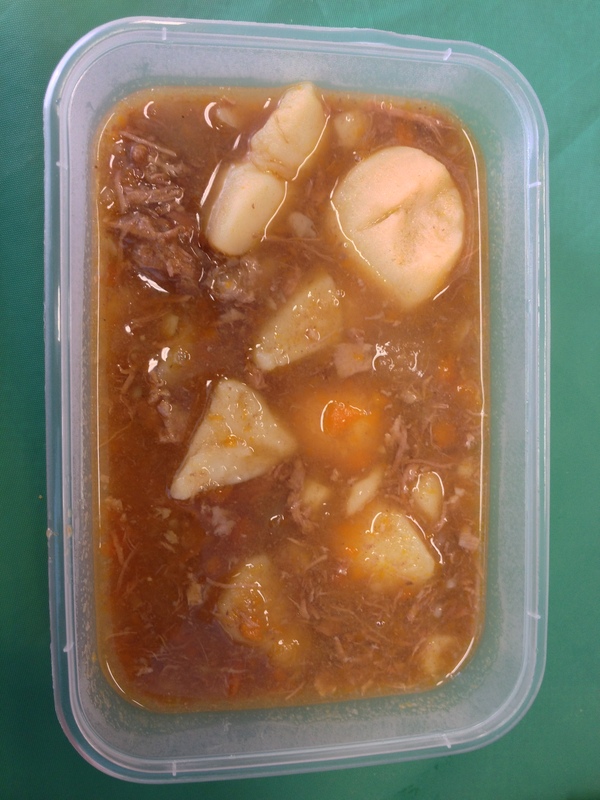 Before the match starts a short detour was required to the local school hall where the club was serving Lobscows, a traditional Welsh stew which garnered universal approval. 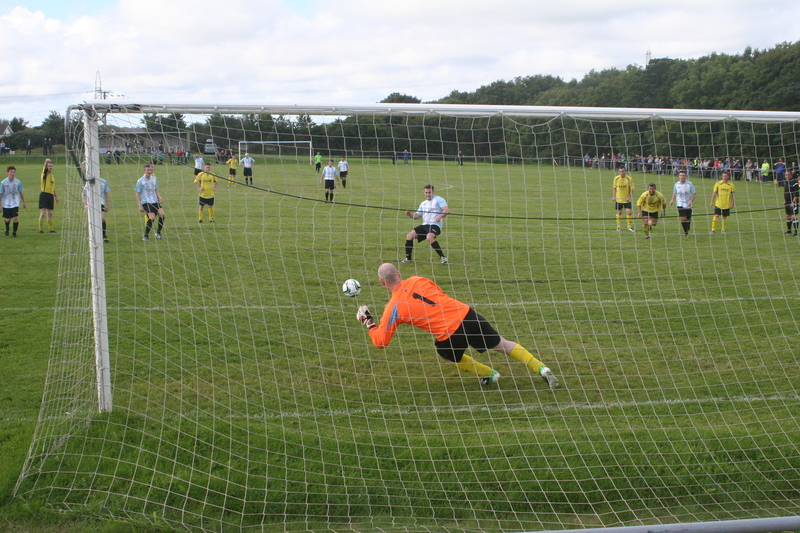 The match saw the visitors dominate, and despite another missed penalty, it bothered the four sheep behind the goal more than the home custodian, Penrhyndeudraeth ran out easy winners by five goals to nil. 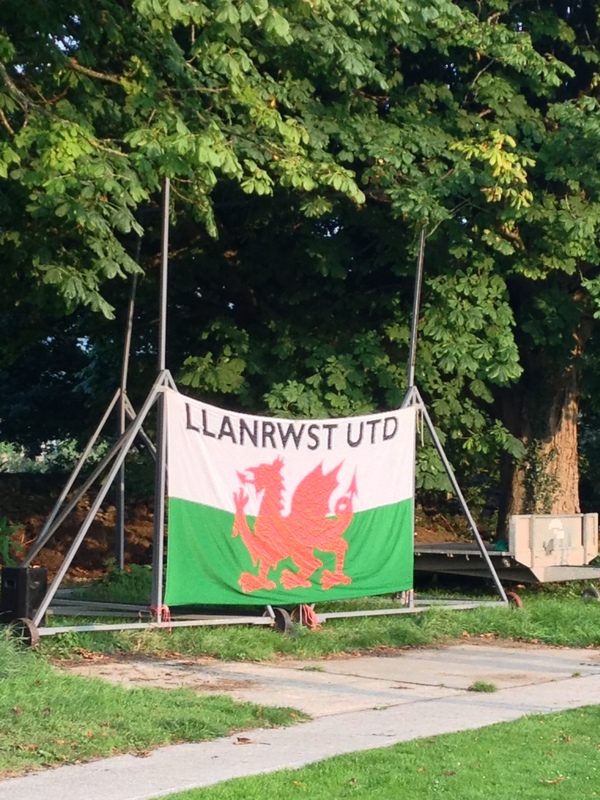 Another warm welcome awaited at Maes Meurig, home of Gwalchmai. A well develop ground with three stands and the strange sight of houses back gardens opening out into the ground itself. 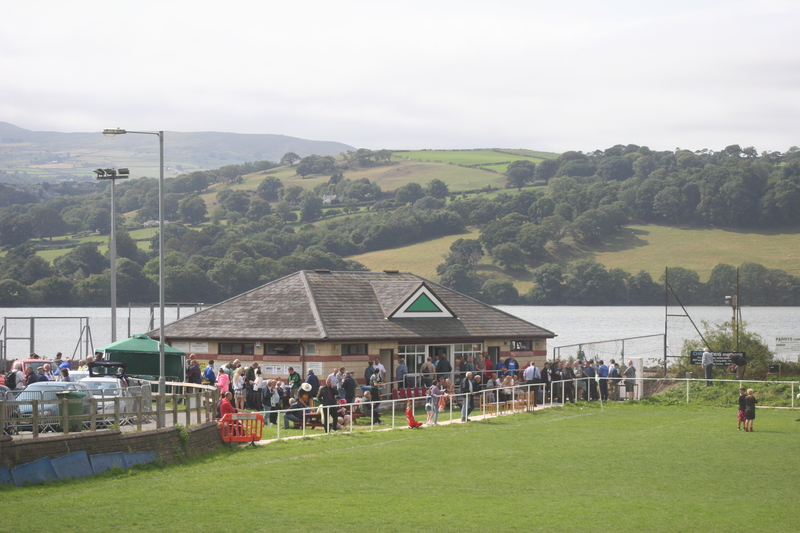 If the locals welcome to the crowd was first class it did not extend to their guests, Llanberis, who were put to the sword by five goals to one, Marc Evans catching the eye with a well taken hat-trick. 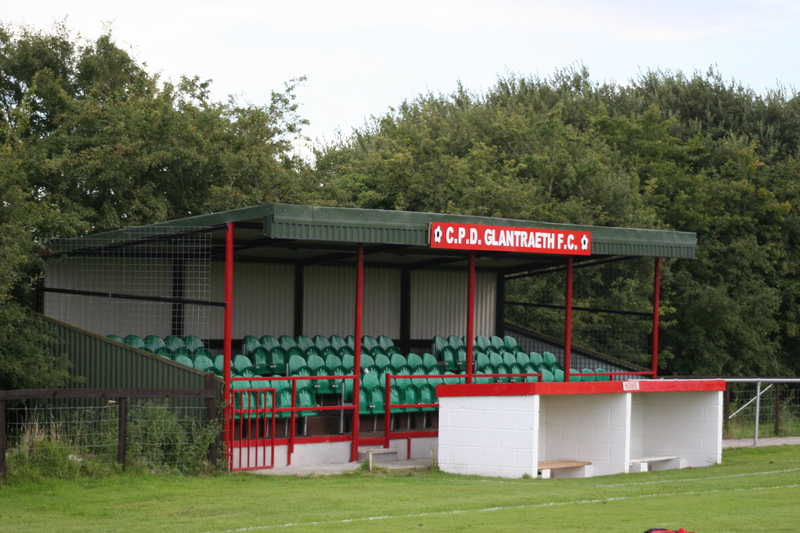 The final game on Anglesey came at the heavenly home of Glantraeth. The Trefdraeth ground is picturesque beyond compare with mountains soaring skyward, colours changing with the advancing evening. 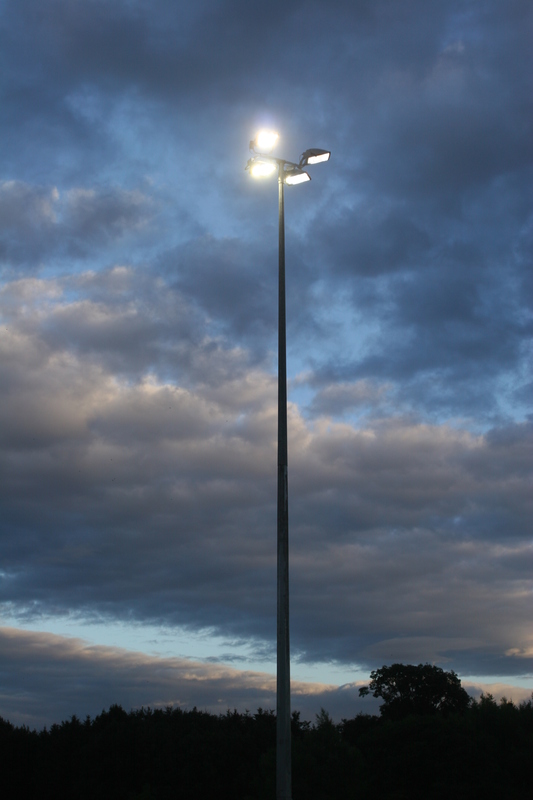 The club put on a super effort with food and drink and a tight encounter is enjoyed by all as the light gently faded. The natural beauty of Anglesey gives way on Sunday morning to urban sprawl as Llandudno Junction ground the Flyover is hemmed in by housing and busy roads. 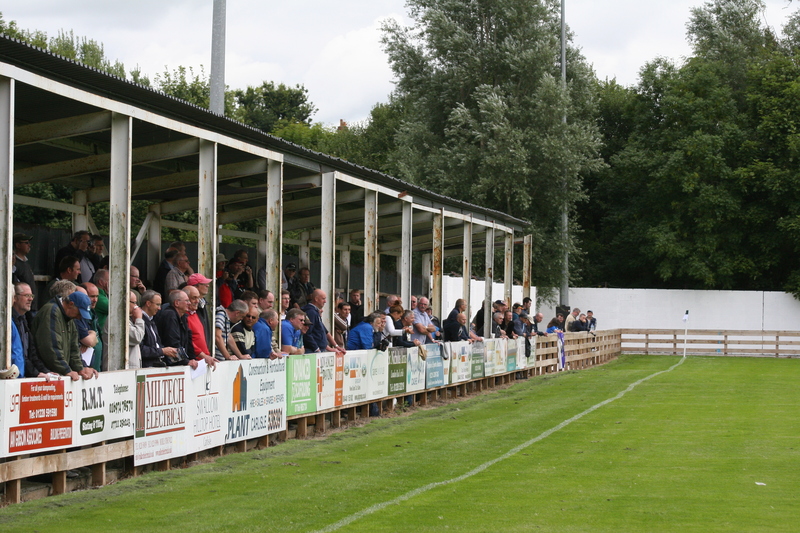 That said the club seems to have a really good core of volunteers and they put on a great effort for their visitors. Sadly for the hosts the visitors, Holywell Town, are in no mood to roll over and dominate from start to finish, the Railwaymen doing well to keep the score down to five unanswered goals. 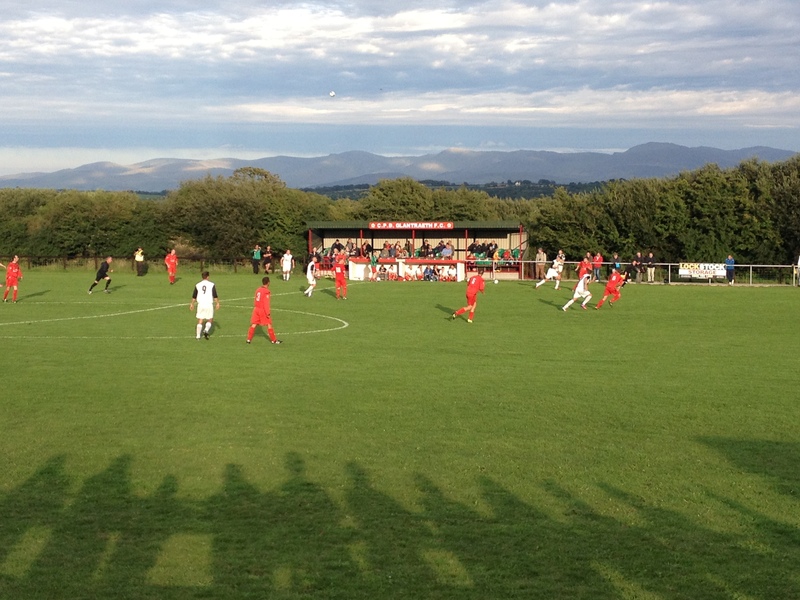 Llandudno Junction (0)0 Holywell Town (2)5 (McElmeel 26, G.Williams 45, S.Jones 56, J.Jones 73, P.Williams pen 80). Just over a mile saw the convoy arrive at Cae Ffwt, the home of Glan Conwy, separated from the River Conwy by a single track railway. The first notable thing about Cae Ffwt is how small the pitch is, narrow and hemmed in, one corner flag so tight to the perimeter only short corners can be taken. 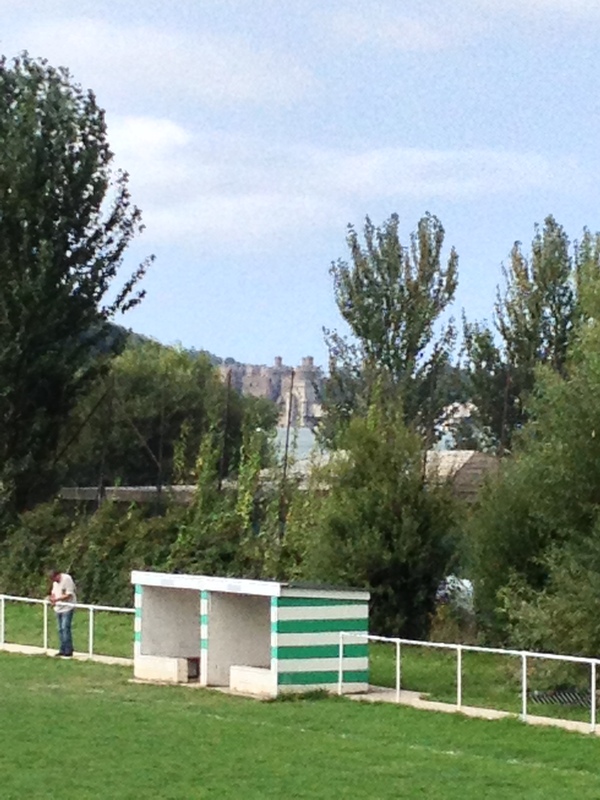 The second notable thing is the vista, Conwy Castle looks glorious behind the green and white hooped dugouts and the bank and the road end provides stunning views of the river with the mountains of Snowdonia beyond. A tight, drawn affair is highlighted by the humourous interjections from the match announcer. 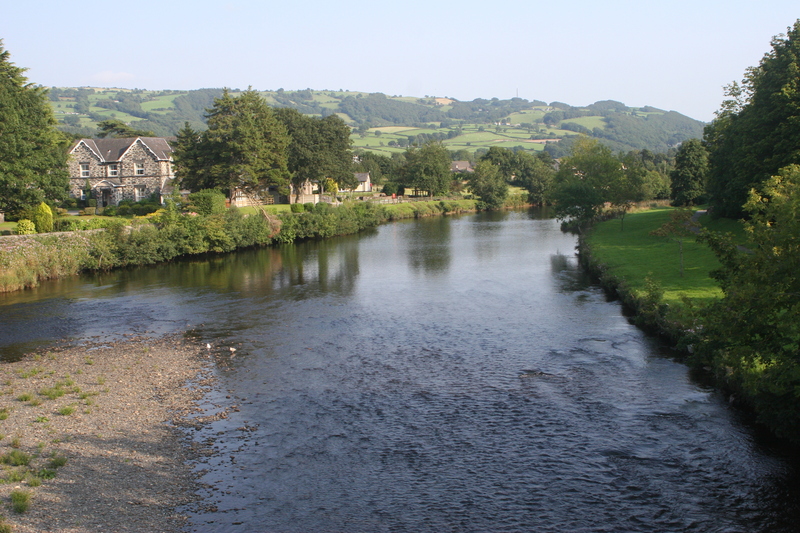 Saturday’s final match was at Llanrwst and followed a particularly edifying drive alongside the River Conwy. 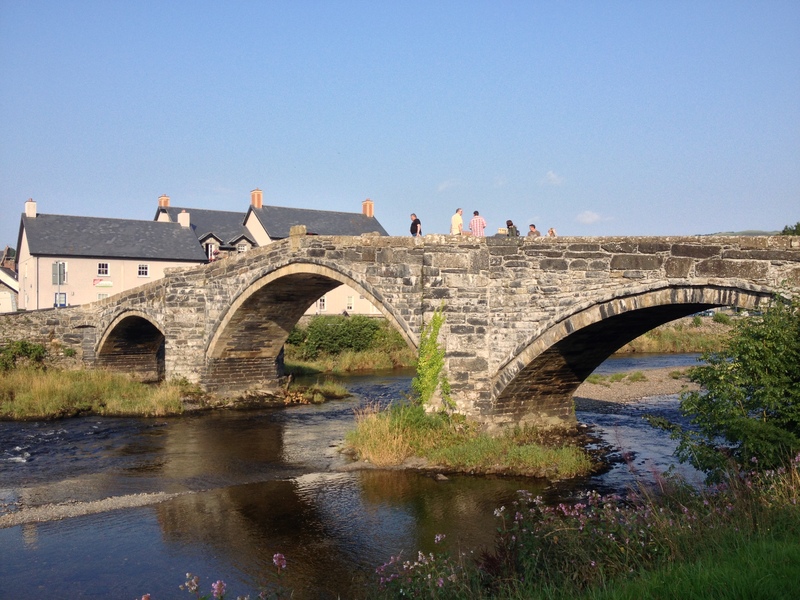 Into Llanrwst means crossing the river via a stunning medieval bridge which groans with the weight of unexpected traffic. 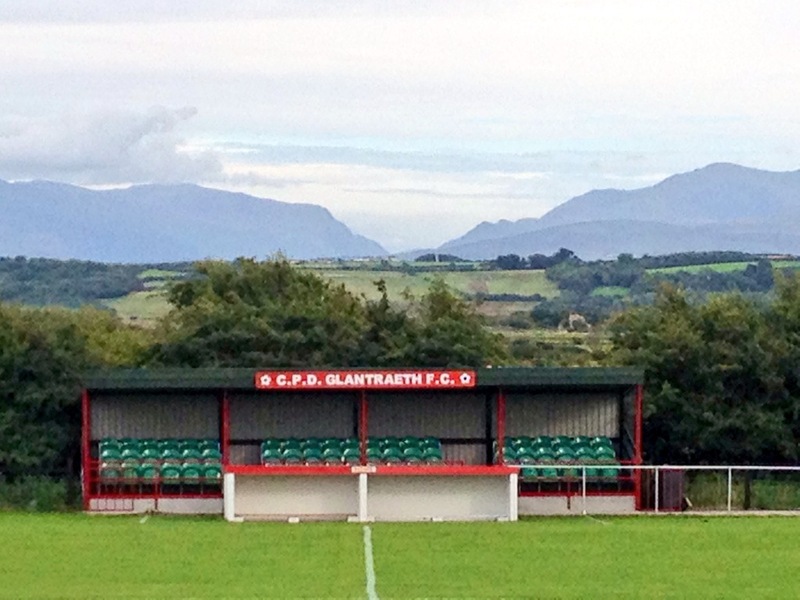 Gwydyr Park, the home of Llanrwst United (a 1983 merger of Llanrwst Athletic and Town), is a stunner. 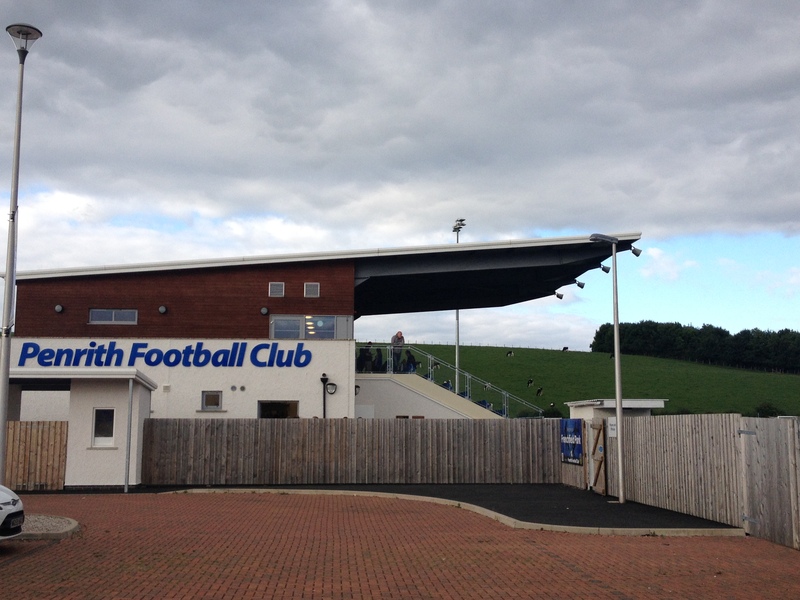 Heavily wooded hills loom over the stand giving scale and beauty to the backdrop. It is the stand rather than the game, a dour goalless slugfest that is the talking point of the evening. 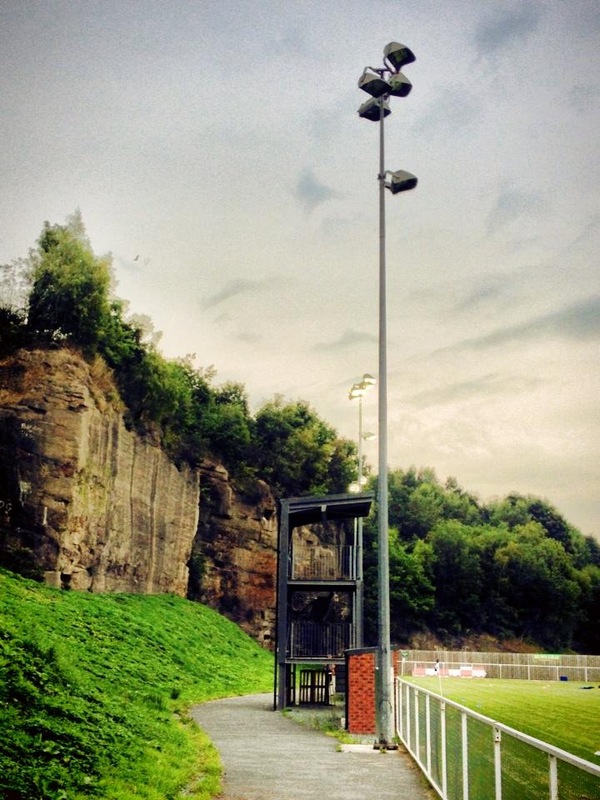 A local official tells anyone that will listen that it came to the village in the 1960’s having been transported from Accrington Stanley’s Peel Park. 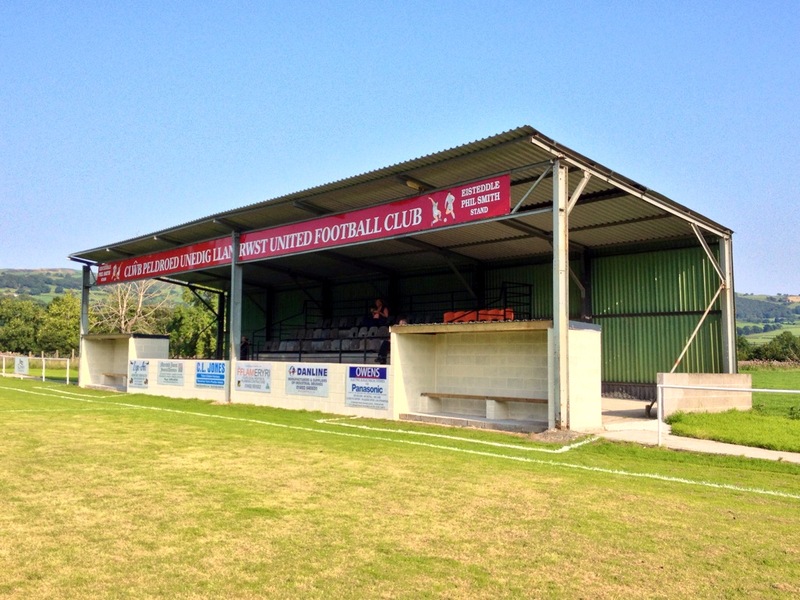 Whether it’s the whole stand or the clearly aged corrugated iron cladding that’s vintage Stanley is open to debate, but it’s the type of romantic myth I would like to believe has at least some semblance of truth to it. Research will be done. What is fact though is there is probably not many more finer places to spend a gloriously warm summers evening. 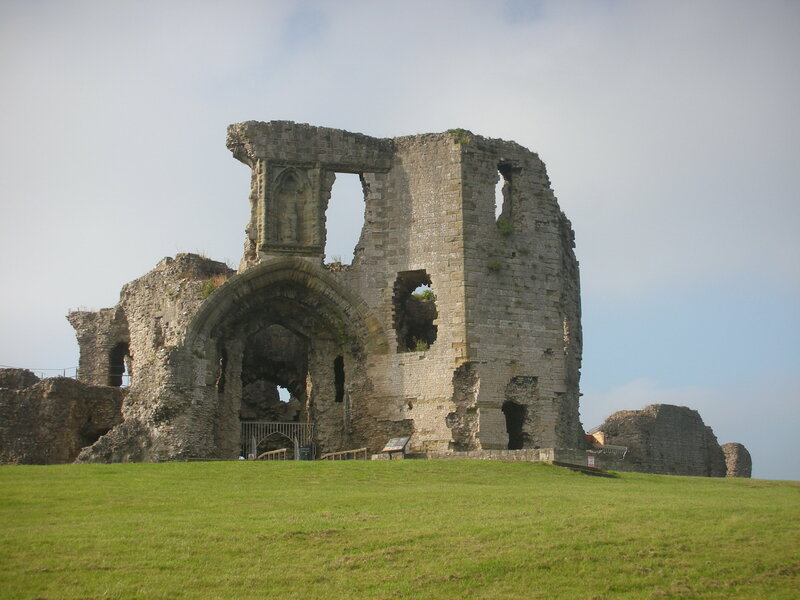 Sunday morning allows a quick visit to the ruins of Denbigh Castle before trundling down to Central Park, home of Denbigh Town. 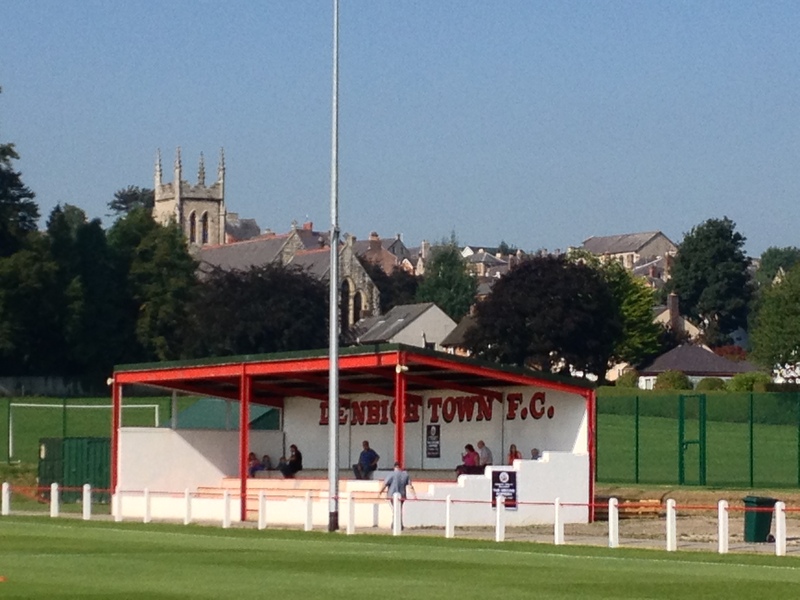 Another scenic ground with a church and a former metal asylum dominating the attractive stand. 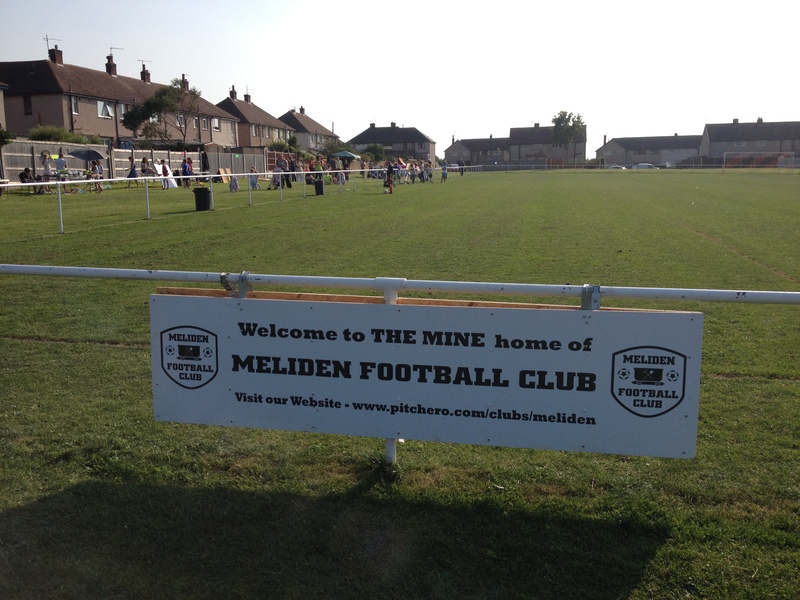 The club go the extra mile with welcome posters all around the ground. 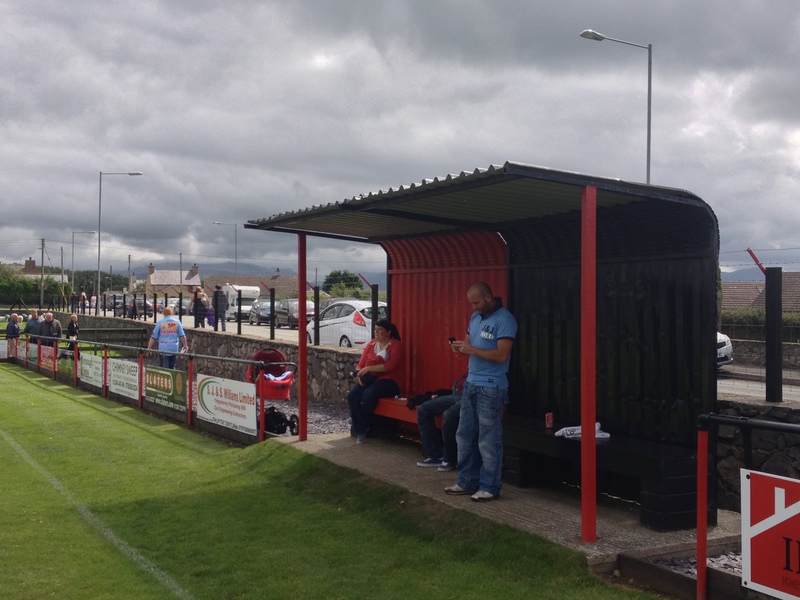 The visitors, Barmouth and Dyffryn United, arrive late and never get going. 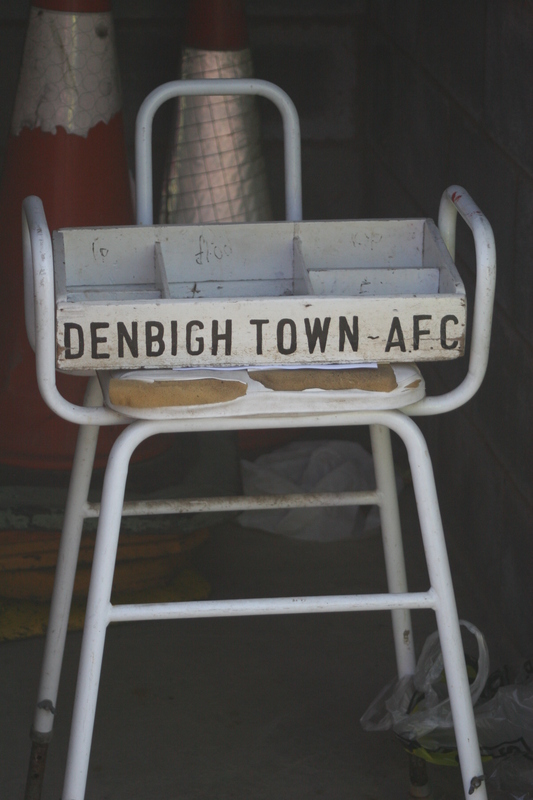 Mike Lundstrom opens the scoring for Denbigh and then the match becomes the Kristian Pierce show as the midfielder bags a very classy hat-trick. 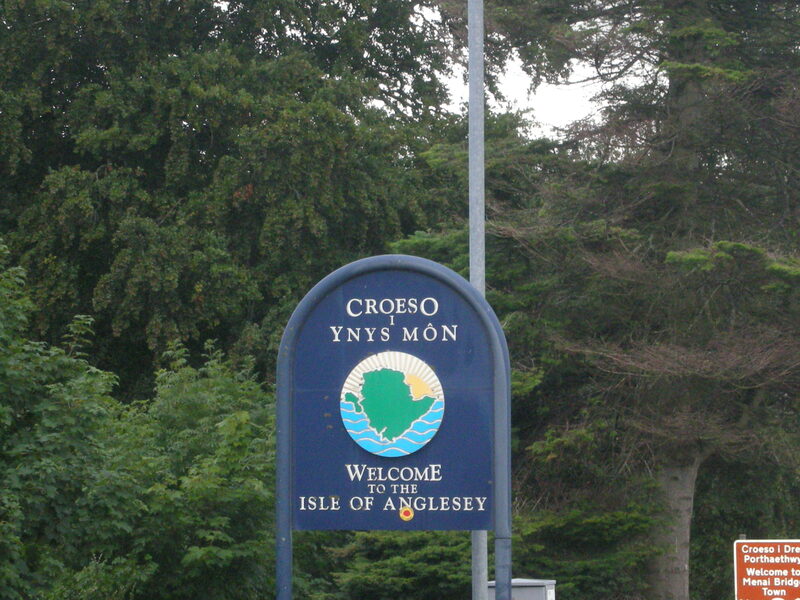 The next game is in the remote village of Llandyrnog, the place looks deserted as the convoy hits town. The pub, the Golden Lion, where the local side was first formed, opens quickly to accommodate its welcome but unexpected guests. The ground itself, Cae Nant, is quirky. The pitch is massively uneven, you cannot see one of the corner flags from the clubhouse such is the camber. 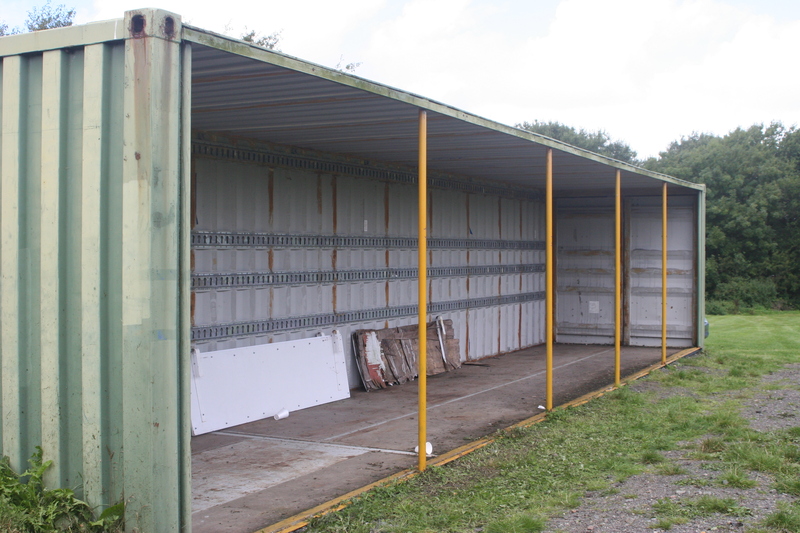 The small stand is partially caged, the club seemingly having lost some of the padlock keys. The visitors are dear old Pwllheli again and to their immense credit they battle back from an early Josh Davies goal to take their first point of the new campaign when Mercall Williams bags a deserved equaliser. The hop ends at Meliden a suburb somewhere between Prestatyn and Rhuddlan. 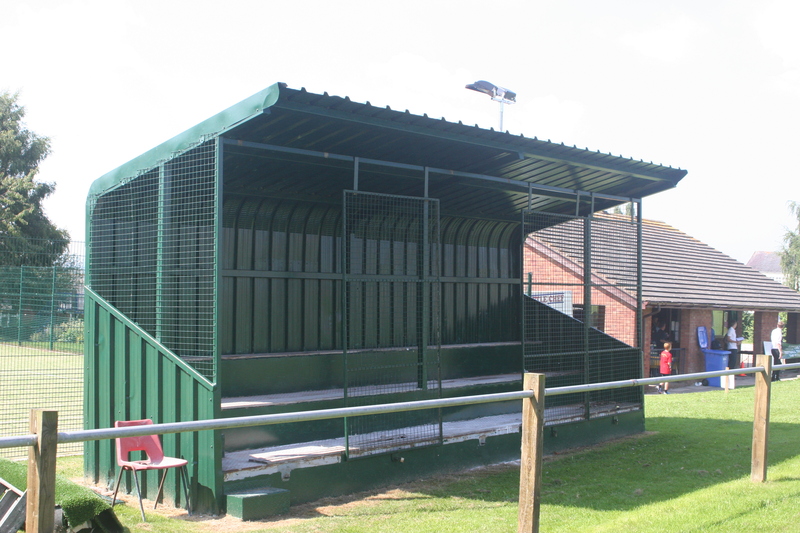 A basic ground with no stand and a small dressing room block could have been a disappointing end to the weekend. What makes it though is the effort of the locals, a family day is underway as we arrive and stalls line one side of the ground, and it’s a happy atmosphere to end the weekend. 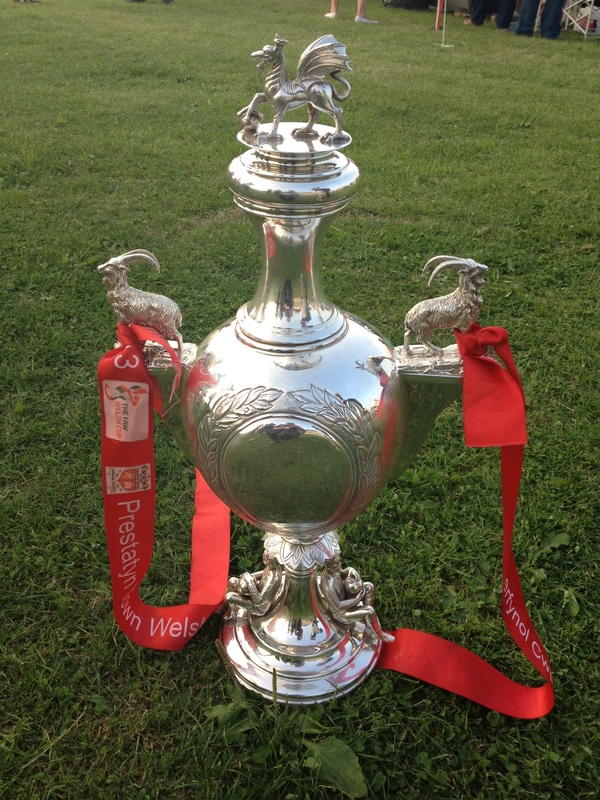 The historic and ancient Welsh Cup, currently the property of 2013 winners Prestatyn Town, makes a surprise but welcome addition to the occasion. 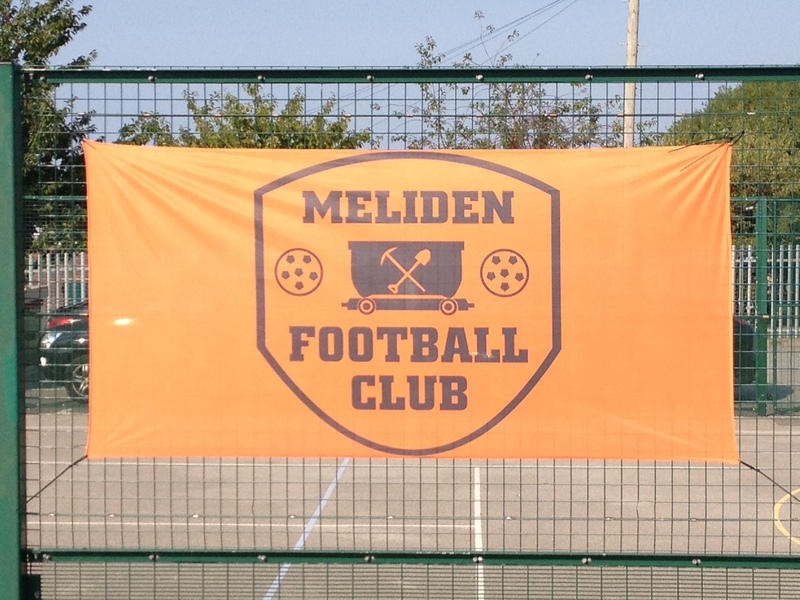 A local derby with St.Asaph ends with Meliden taking the points with two hard earned goals. So once again a superb weekend faultlessly arranged by the experienced Groundhop UK team. Marvellous weather, welcoming clubs, scenic grounds, and a good standard of football, I think they might just have discovered the very elixir of life itself. Bank Holiday traffic in the UK can be a royal pain in the proverbial so when it became clear that the plan to join the global gathering at Greenfield for the first game in the Welsh Alliance groundhop was going to be scuppered by a cornucopia of traffic delays, a back up plan needed devising. 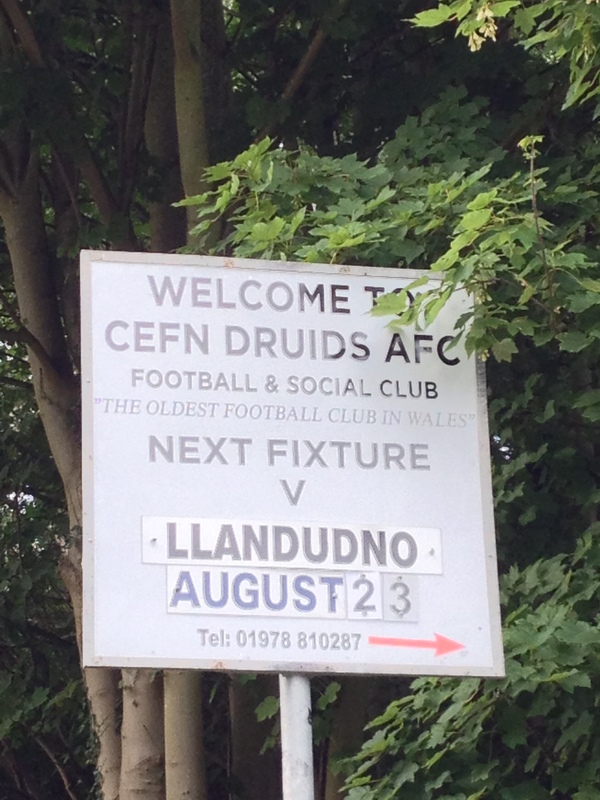 The 6.30pm kick off arrived just as I drove into the principality so the only real footballing alternative was the 7.30pm start at Cymru Alliance club Cefn Druids. “The Ancients” had moved from their previous ground in Plaskynaston Lane, now a Tesco superstore, to a newly built venue at The Rock in Rhosymedre in August 2010. 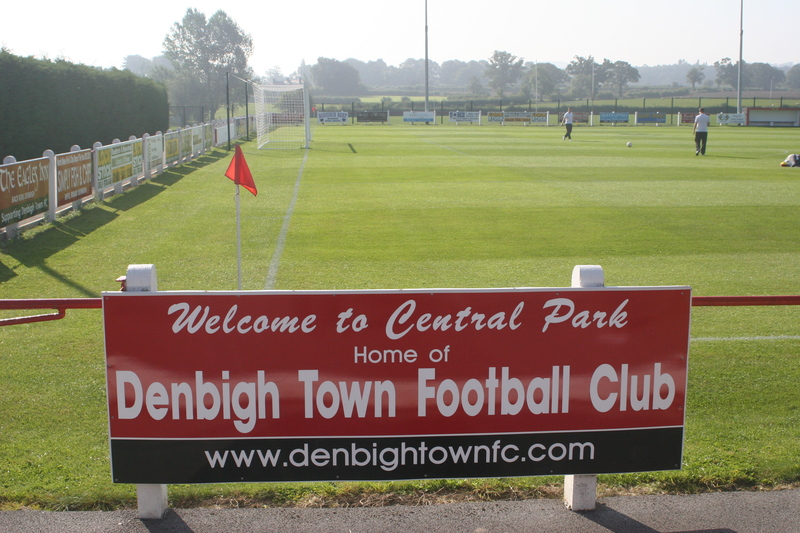 The clubs’ roots are steeped in history, the current nomenclature being a 1992 union of the Cefn Albion and Druids United. 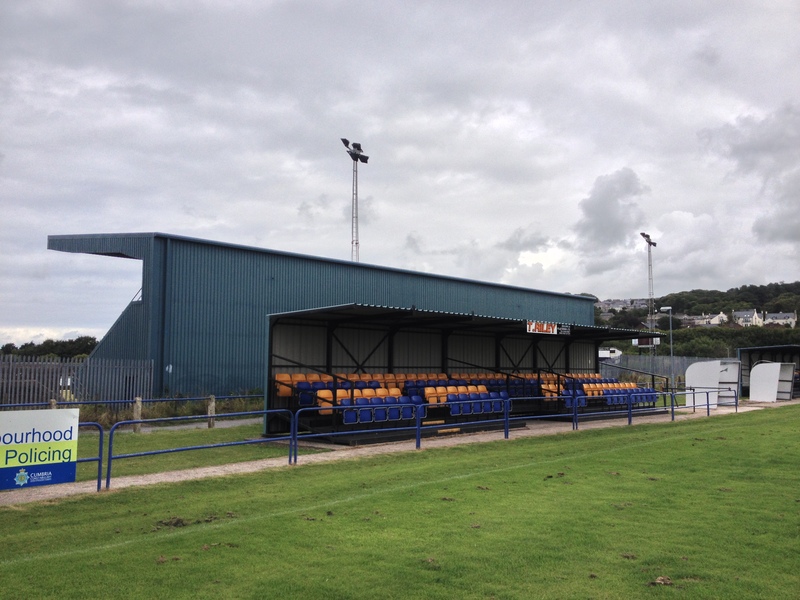 The Druids were formed by David and George Thomson in 1869 as Plasmadoc FC, and as such are the oldest club in Wales. 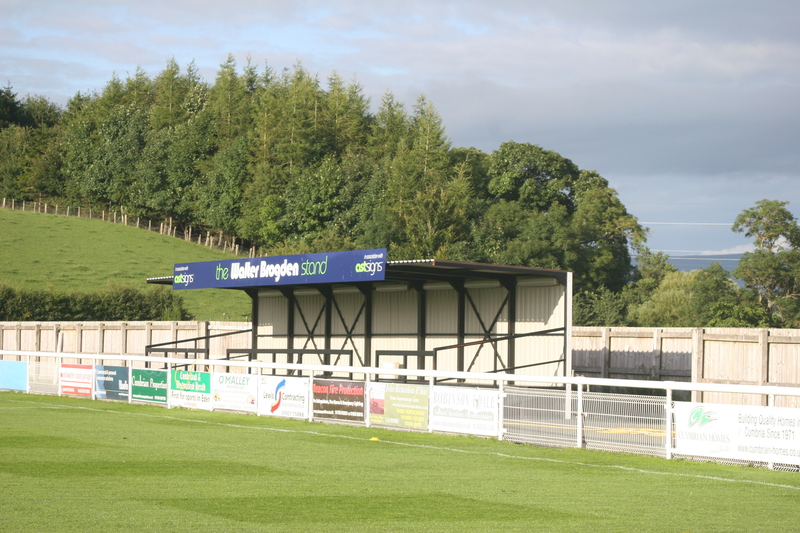 Based in Ruabon, within three years the club had been renamed Ruabon Druids after a merger with Ruabon Volunteers and Ruabon Rovers. After losing the use of Plasmadoc Park in 1878 the club were now playing at Wynnstay Park. 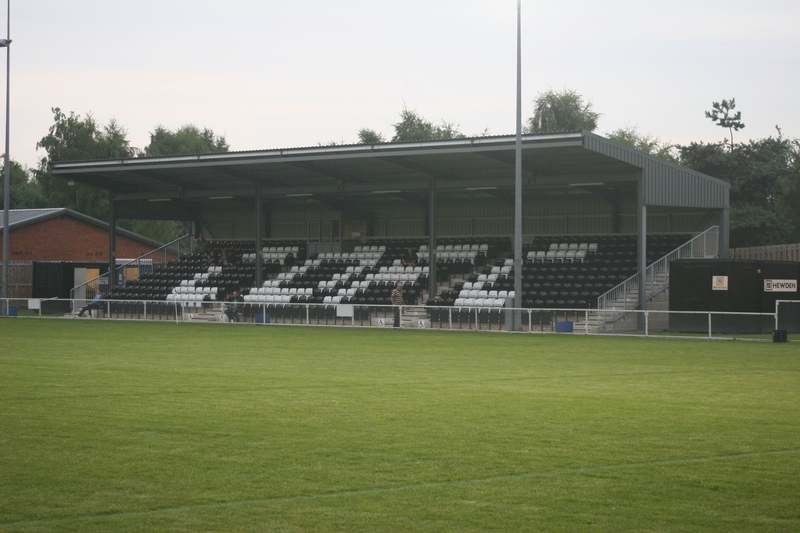 The Druids had become a powerful force, becoming the first Welsh club admitted to the FA Cup and also competing in the Birmingham and District League. Ruabon holds another piece of footballing history as in 1876 the Football Association of Wales was established in the Wynnstay Arms Hotel. Druids would merge again in 1920 with Rhosymedre FC who played at the Church Field, it was a marriage borne out of convenience as Druids were struggling financially and Wynnstay Park had become unusable. Three years later a further merger, with Acrefair United occurred. This meant a further name change from Rhosymedre Druids to Druids United. The club are eight times winners of the Welsh Cup and have a truly impressive honours list, staggering for a club from the small industrial village of Cefn Mawr. 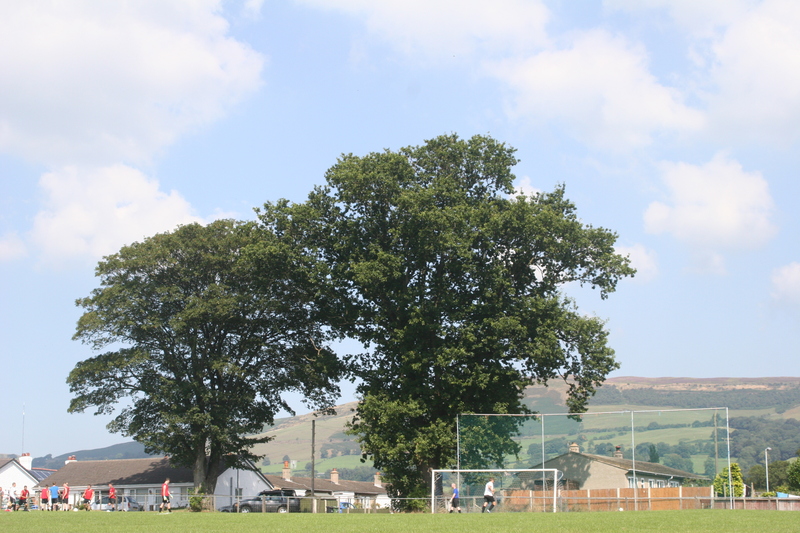 Cefn Mawr (“the big ridge”) thrived while iron, sandstone and coal extraction was king, but by 1992 hard times meant that a final merger with village rivals Cefn Albion was a matter of mutual survival. 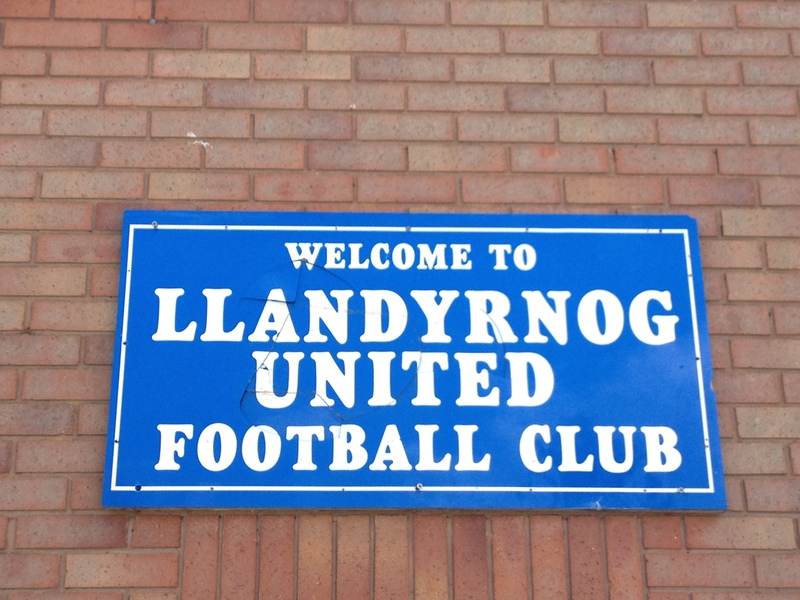 The combined force saw no little success and The Druids competed in the Welsh Premier League between 1999 and 2010. 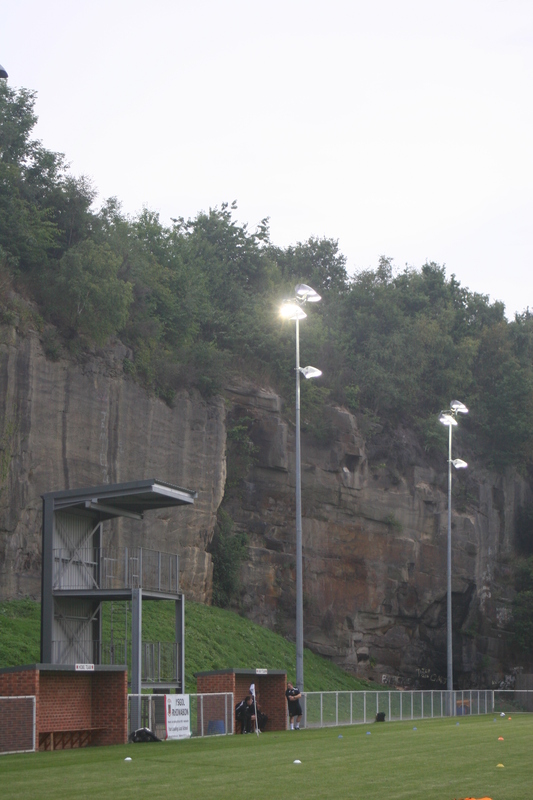 The village itself has had a rich industrial history, and it seems wholly appropriate that when a new location was needed for the new Druids ground a disused quarry was selected as the chosen site. Legend has it that this very quarry produced the stone used to build the nearby Pontcysyllte Aquaduct, a World Heritage site that spans the River Dee in all its multi-arch glory. It’s this very sort of past meeting present that makes this modern venue a truly beguiling one. 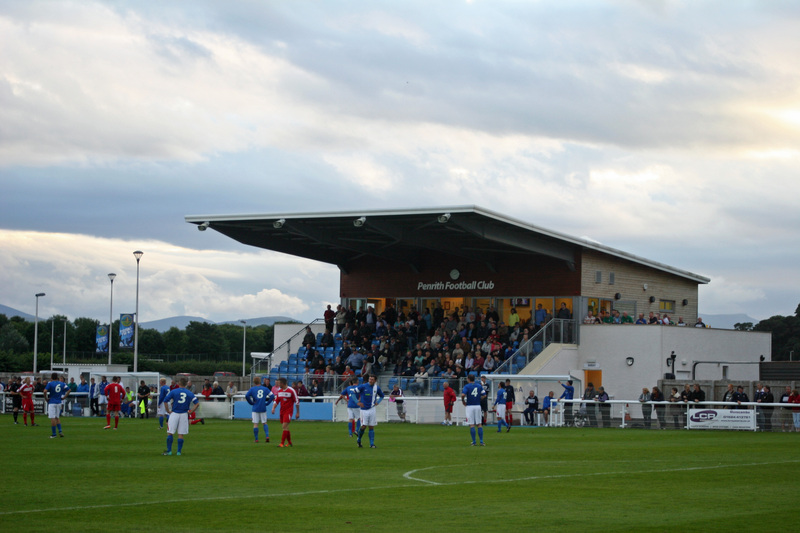 The new ground opened in August 2010 and sparked a revival in fortunes. In 2011/12 the club reached the Welsh Cup Final for the first time in many years and despite a 2-0 defeat to The New Saints, won a Europa League place for the following season. The Druids European adventure was short lived however, going down 0-5 on aggregate in the first qualifying round to Finnish side Mypa. 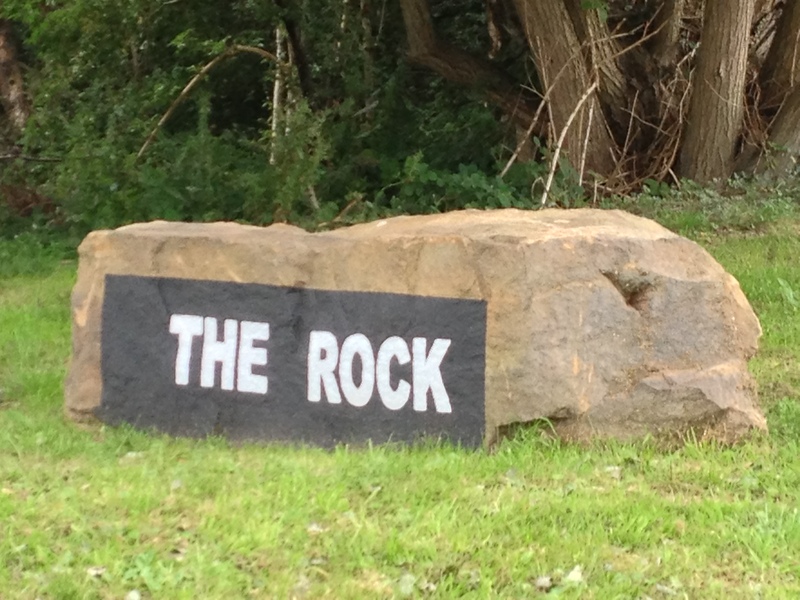 With a shiny modern home hewn carefully from the quarry yet retaining the eye catching escarpments Cefn Druids look set for a bright future with The Rock becoming a hub of village life. 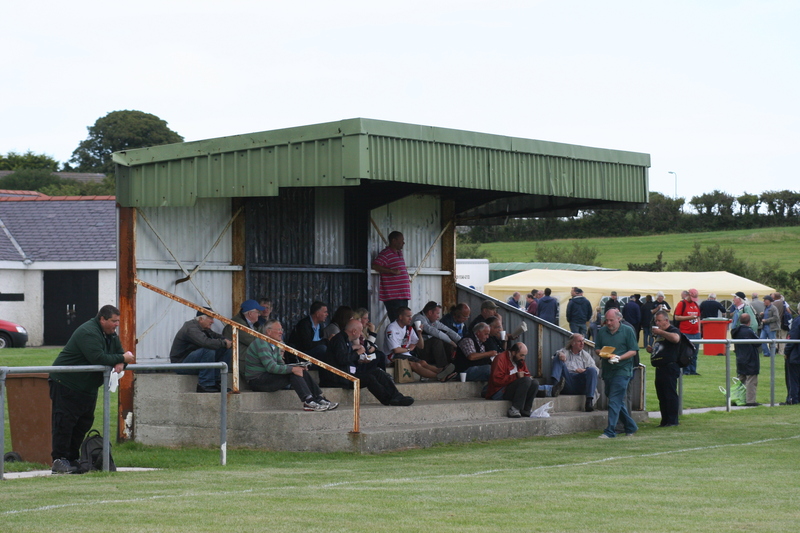 This Cymru Alliance match against Llandudno saw the Ancients systematically dismantle their guests in front of a healthy crowd of 236. 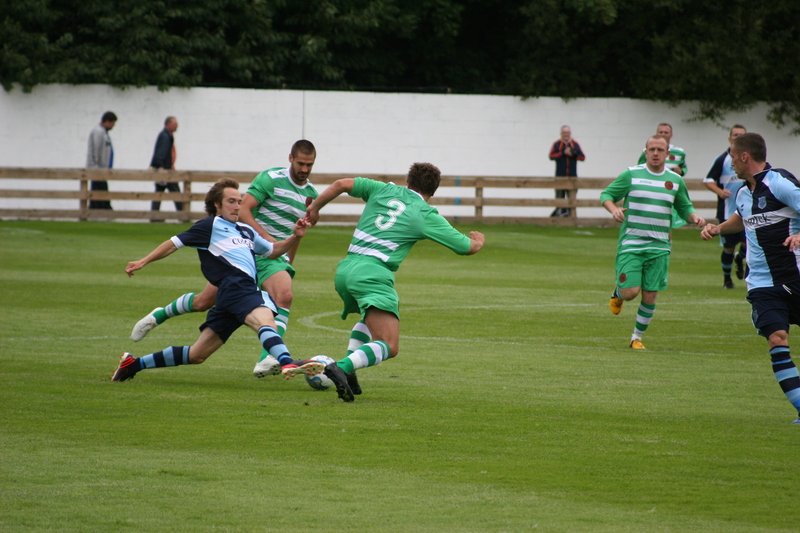 Just three minutes into the game and skipper Robbie James slammed the Druids into the lead with a crisp drive. 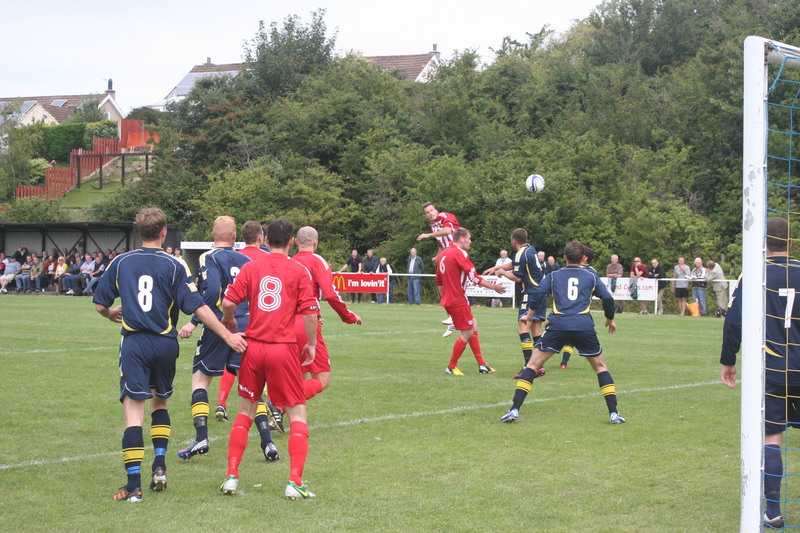 After 16 minutes Mike Pritchard’s goal bound shot hit James on the way past a stranded Andy Metcalf in the Llandudno goal. Matty Owen made in 3-0 after just 21 minutes of action. 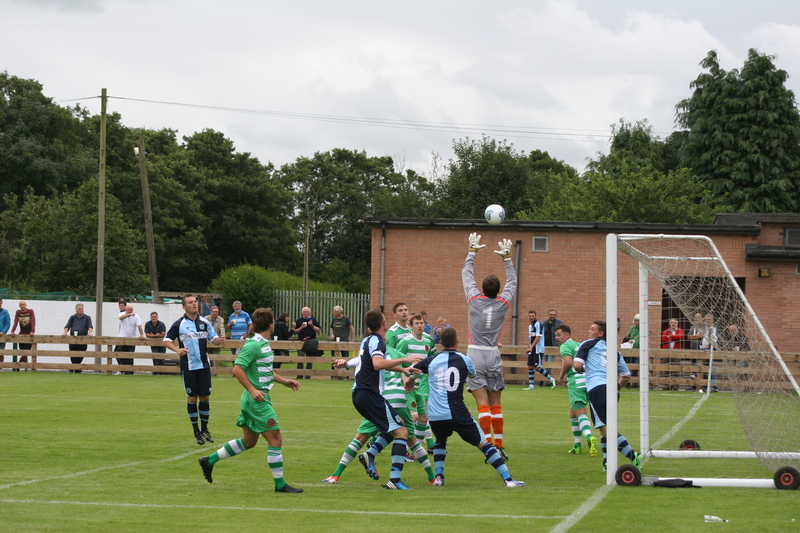 The visitors offered a rare sortie on goal two minutes from half-time and it produced a goal for striker Lee Thomas. In truth there was no realistic chance of a comeback and this was confirmed with a brace from Scott Quigley after 78 and 90 minutes. 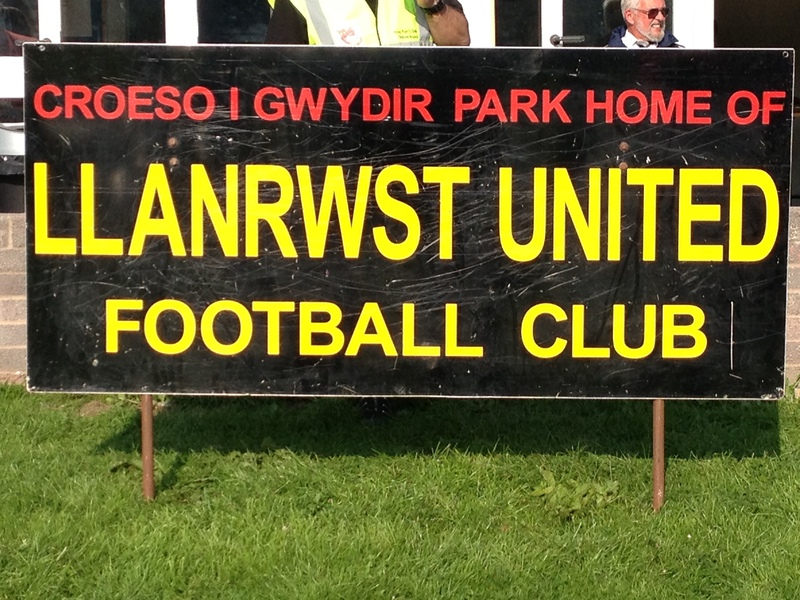 It was a clinical display from the home side and one that augers well for a tilt at the Cymru Alliance title. 1. Dave Maguire, 3. Matty Hughes, 4. Adam Hesp, 6. Robbie James ©, 7. Scott Quigley, 8. Matty Owen, 10. Mike Pritchard, 11. 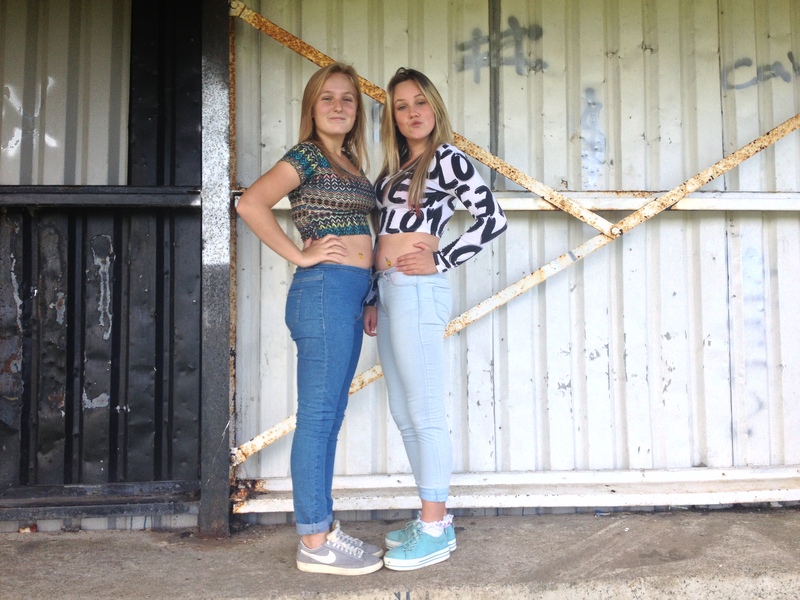 Jamie Haynes, 15. Matty Hurdman, 19. Ross Ankers, 20. Ryan Jones. 1. Andy Metcalf, 2. Paul Roberts, 3. Con Tierney, 4. Arron Pritchard, 5. Matty Singleton, 6. Joel Richardson, 7. Iwan Williams ©, 8. Dean Seager, 9. Lee Thomas, 10. Toby Jones, 11. Josh Macauley. Subs: 12. Joe Williams (for 3, 66 mins), 14. Darren Jones, 15. Asa Hamilton (for 2, 62 mins). Not even a 4 a.m. departure from the plateaus and gentle undulations of Essex could dampen the ardour for the Cumbrian Groundhop. 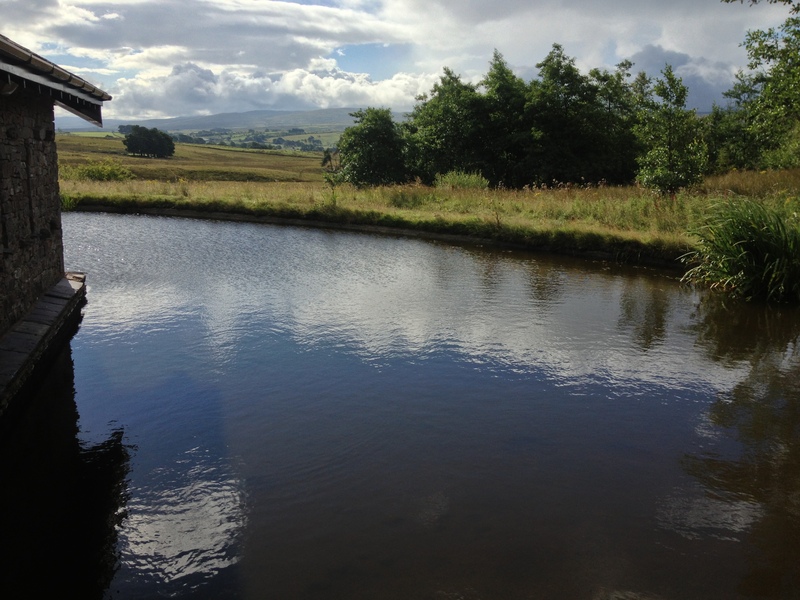 Taking in three Northern League outposts scattered thoughtfully around the northern Lake District area amid wistfully verdant valleys and brooding mountains. It was not only to be a celebration of the area’s outstanding natural beauty but also the first instalment of a season long celebration marking the 125th Anniversary of that most fiercely traditional of competitions, the venerable Northern League. No Premier Division, no play-offs, championship pools and relegation pools to be had here. Division One and Division Two, up and down and that’s it. Nowt fancy. I like it. They also invented the concept of organised groundhops, the crazy fools. No trip to Cumbria’s welcoming arms would be complete without an early morning repast at the ever inviting Tebay Services, a charming and greatly successful anathema to all that is wrong with consumer culture and motorway travel. 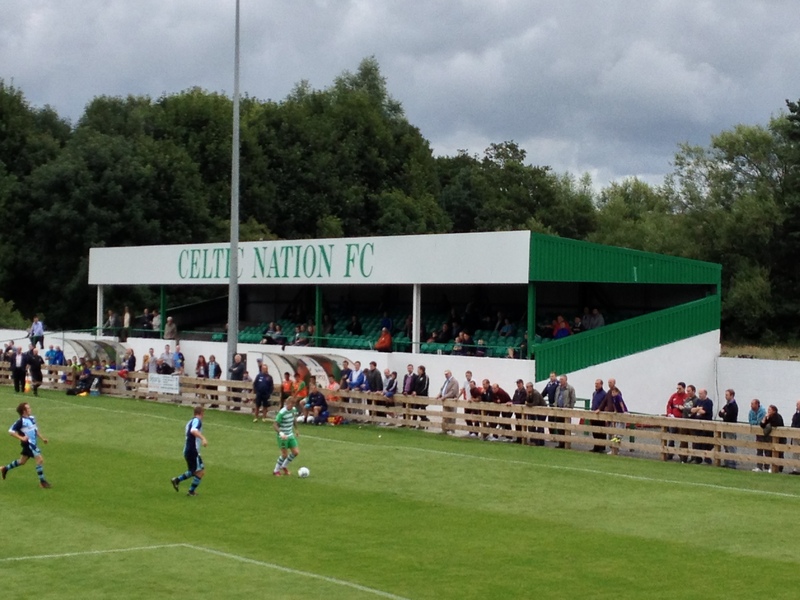 Suitably refuelled and many miles behind us it wasn’t long before the day’s first venue was reached, Gillford Park Stadium, erstwhile home of the Railway Club and latterly headquarters of the burgeoning force that is the Celtic Nation Football Club. 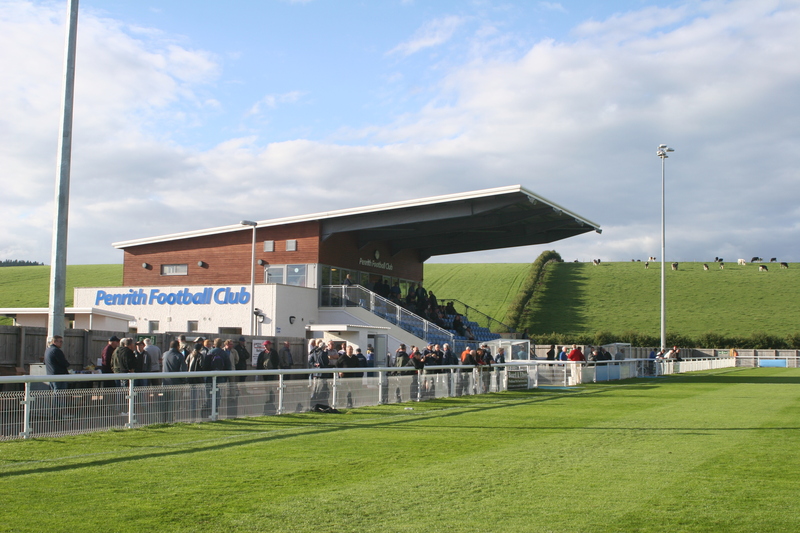 Rebranding is an emotive subject among football cognoscenti and while the re-colouration of Gillford Park has yet to be completed it is a really impressive arena. To the right a large green stand, half filled with seats and half banked up as a covered enclosure, it’s a smart edifice. 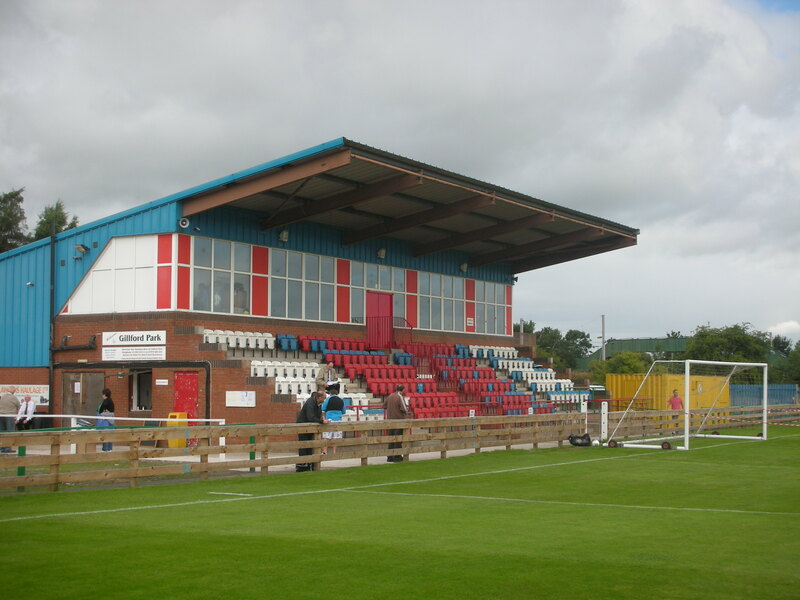 Behind the goal is a large and eye catching cantilevered stand with red, white and blue seating looking distinctly at odds with the pervading colour of the Celts. 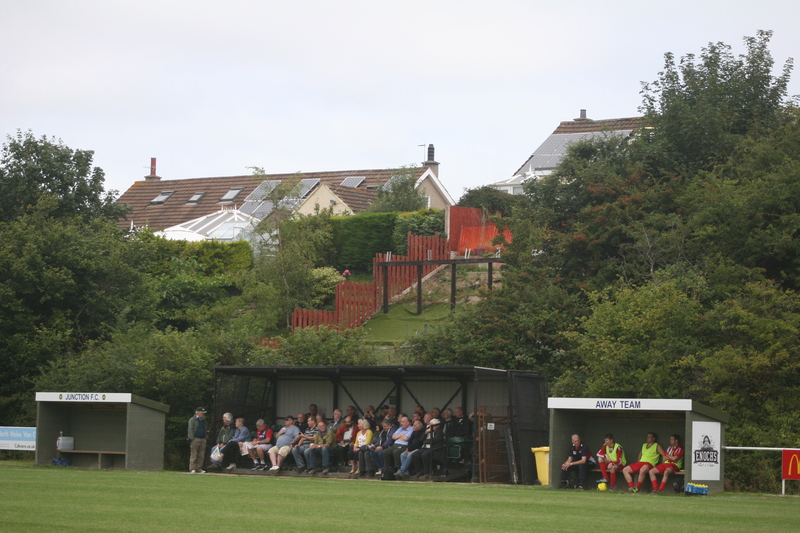 To the left is an ancient covered terrace which backs on to a more modest home of Northern Alliance outfit Harraby United. 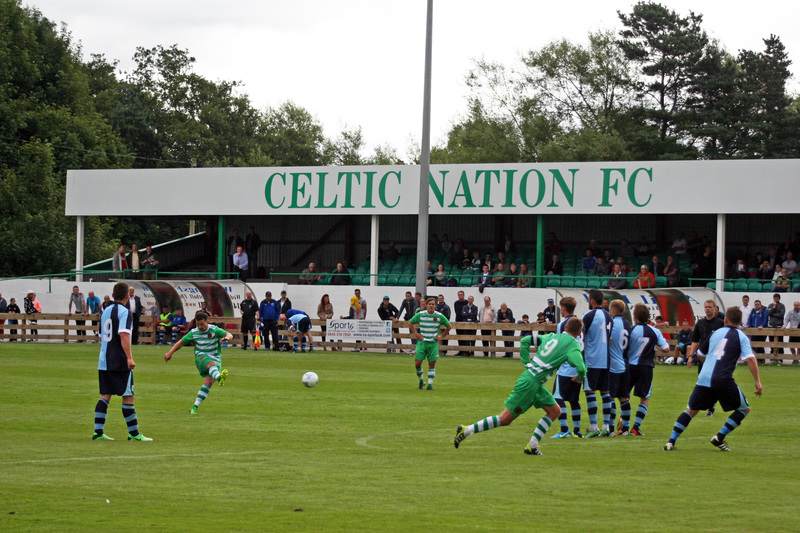 With a former Football League manager, Mick Wadsworth, at the helm and a squad full of experience, all seems set for the Celtic juggernaut to head full steam into the new season. Well if that was the script then visitors Bishop Auckland had clearly chosen not to read it. By far the more impressive and attack minded of the two combatants there was no real surprise when Robert Moncur deftly opened the scoring for the Two Blues on 24 minutes. 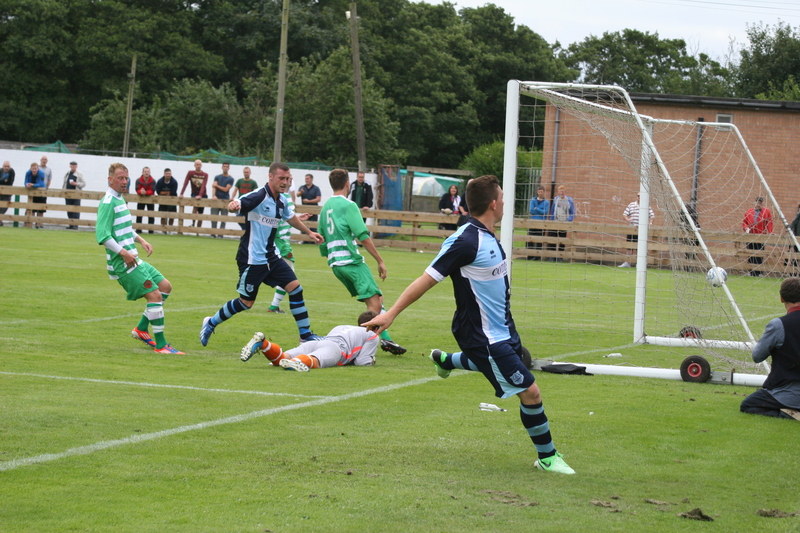 What was a surprise was that the visitors failed to extend their lead at any point and it was left to home substitute Jonathan Allan to score a scarcely deserved equaliser three minutes from full time. The one time undisputed “Kings of Amateur Football” could feel somewhat hard done by in the final reckoning of this game. A good start to the day and even a spot or two of rain in this county feels like an invigoration rather than an annoyance. The hop wound its way to the coast of this fine county and the sweeping bays of Whitehaven and fine if somewhat fleeting views on a cloudy day of the Isle of Man. 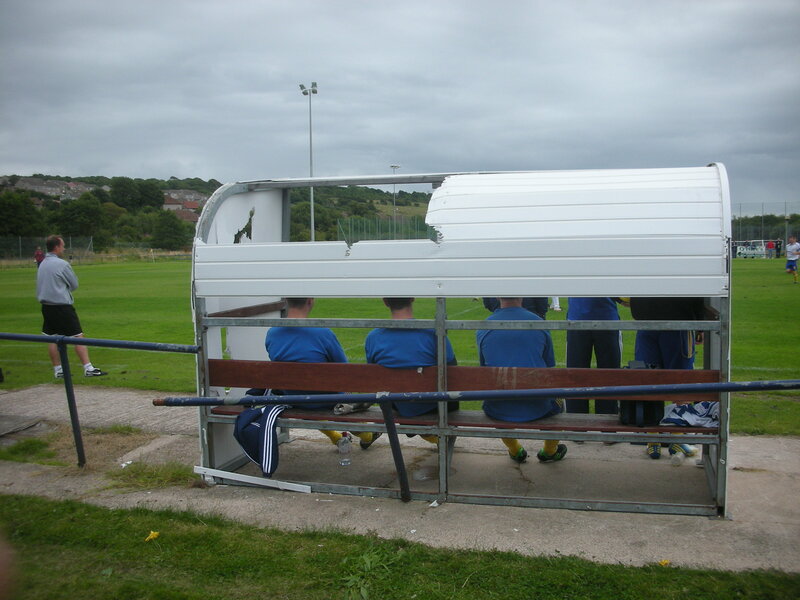 Rumbling into the Coach Road Sports complex, a match is already underway on the pitch of Cumberland County Leaguers Whitehaven Miners Social. 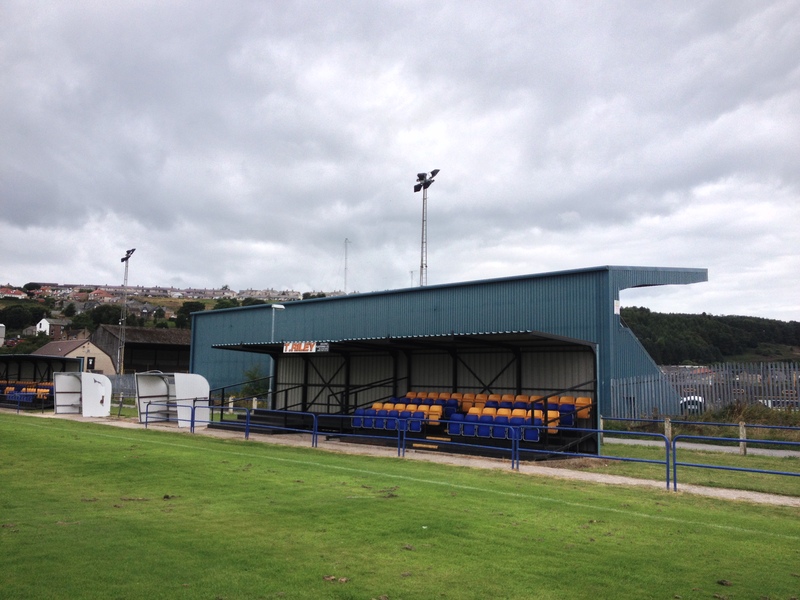 Sandwiched in between the two football grounds is the majestic home of Whitehaven Rugby League Club, all cavernous shelters, crumbling terracing and retro crush barriers. It really is a fantastic sports venue whatever the code. 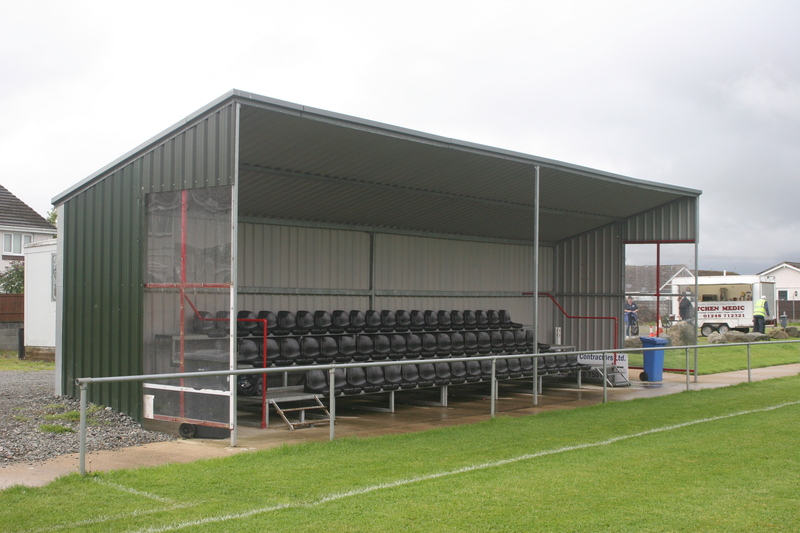 The injection of fresh enthusiasm bought about by the rugby ground quickly dissipated with the heart sinking sight of two modular Arena Seating stands in place at the home of Whitehaven Amateurs. Aside from the metallic equivalent of the plague for ground enthusiasts the hosts have gone to some welcome effort on their big day and cope well with a near record crowd for the venue. Volunteers man their stations and provide the descending hoards with welcome sustenance. The clubhouse then becomes a frenzy as the packs of pre-purchased match programmes belatedly surface. The clubhouse walls display impressive plans for a more luxurious future for the club. Time is spent in the convivial company of master lensman Stuart Clarke, approachable and effortlessly cool, it’s an honour watch a craftsman at work. On the field the home side dominate from the off and establish a two goal advantage through two excellent finishing from the impressive Darren Donald. The visitors, Chester-le-Street Town, however, refuse to lie down and Andrew Grant-Soulsby rams home a loose ball after 77 minutes to reduce the arrears. 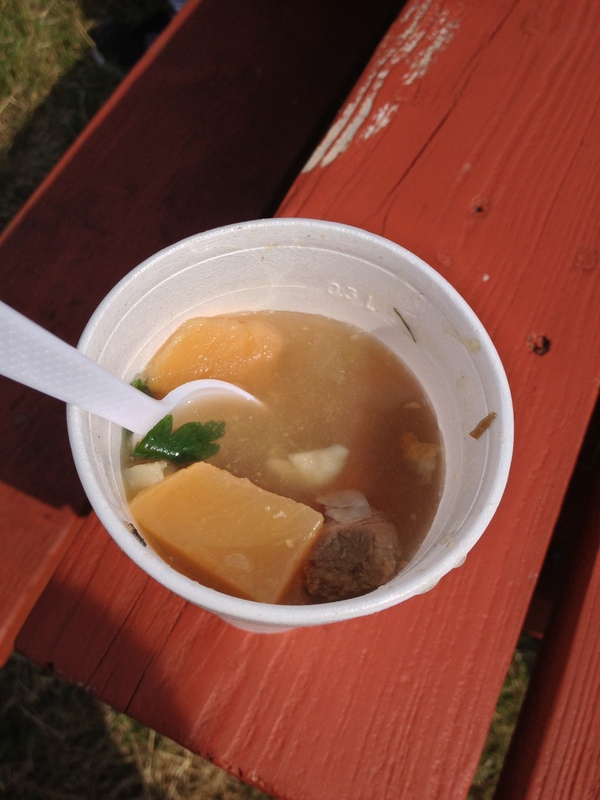 That proved to be the lone reward for their toils as the Amateurs ran out deserving winners. 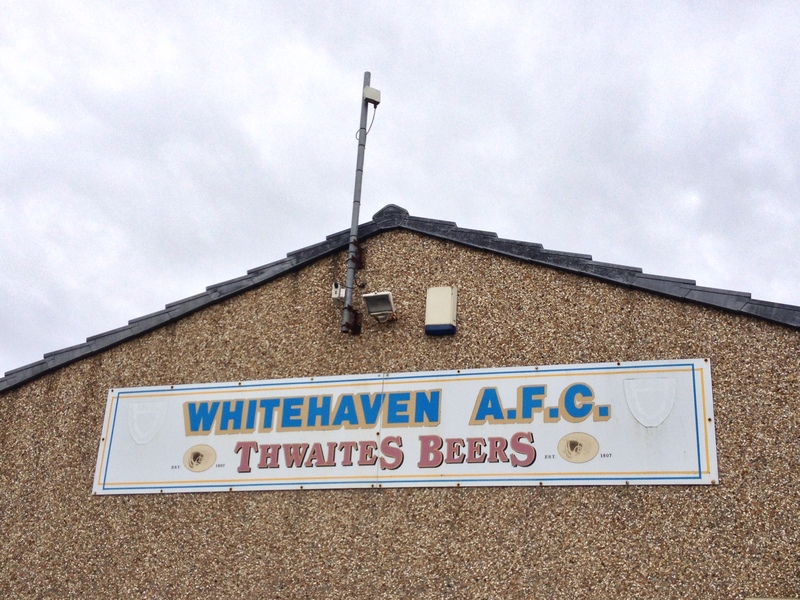 Whitehaven proved to be welcoming and capable hosts and many departed with no little admiration for their fortitude in persisting in the shadow of a much larger sporting neighbour. 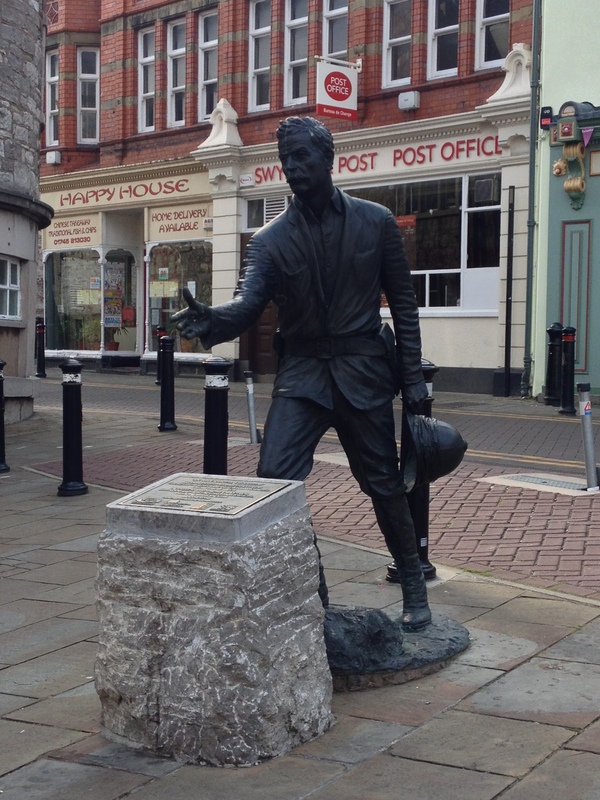 The route to the final game at Penrith takes in a favoured route of this writer. 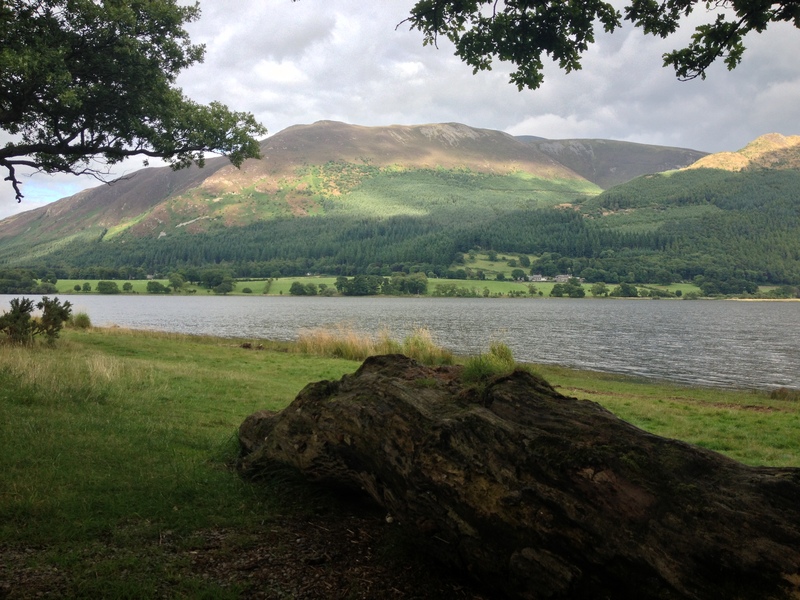 The A66 hugs the banks of Bassenthwaite Lake (the only Lake District body of water that actually has “Lake” in its name) and its silvery waters shimmer so invitingly in the early evening sun a stop at the accessible Blackstock Point becomes essential. Meanwhile the mighty Skiddaw, always an impressive sight, looms menacingly in the background, its peak shrouded in low lying cloud. It’s a beautiful drive through landscape so lovingly recounted in the iconic books by Wainwright. 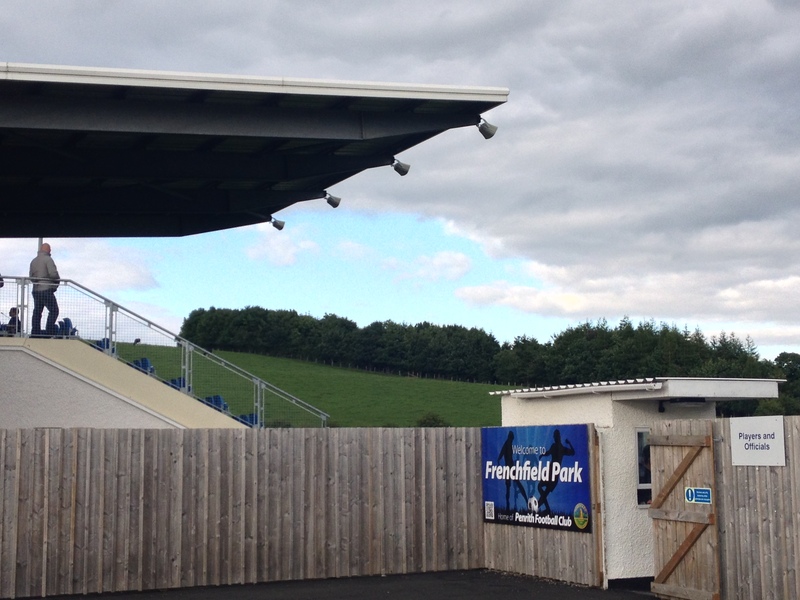 Having been particularly fond of their old town centre ground at Southend Road, Penrith’s relatively new home of Frenchfield Park had its work cut to impress me. A long approach road sweeps into a sizeable car park and the grandstand and clubhouse cut a clean and impressive figure. Egress is obtained and there is already growing consternation about a lack of match programmes at such an early hour. This minor grumble aside it’s a plush modern venue that suits the club’s aspirations but it’s out of town location gives a nice pastoral feel to proceedings. 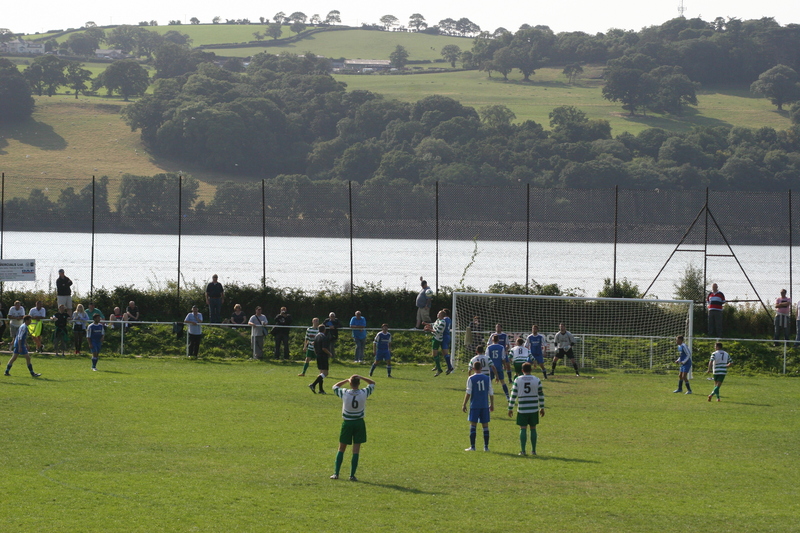 A bank behind one goal provides grazing cattle with a great view of the ensuing encounter. What an encounter it turns out to be, visitors Newton Aycliffe secure an early and commanding lead when Daniel Earl netted twice in a minute in the opening quarter of the match. The home side get a goal back before half-time and Penrith go into the break with wind in their sails. Unable to capitalise it’s the visitors that restore their two goal advantage much to the delight of their boisterous travelling contingent on the clubhouse balcony. Steven Rigg manfully hauls the homesters back into the game with his and their second goal and it looks like we are in for a grandstand finish to the game of the day. Alas, it was not to be and Jamie Owens’ second goal of the game four minutes from time secures the points for the impressive guests. So there it ended a good day all round, friends old and new dispersing into the enveloping night for all corners of the nation. To parody a line from one of Cumbria’s favourite sons, Alfred Wainwright, sometimes solitary wanderers who find contentment in the companionship of the open road and likeminded creatures. The one time Borough Engineer from Blackburn was a real stickler for detail in his faithful documentation of every nook and cranny of the Cumbrian Fells. It stands as a timely reminder that organising of a Groundhop is not a formality and perhaps a gentle tweaking of the minutiae of requirements will mean we have a grand season once again in the company of our friends in the North.